One problem with the film is an inability to connect the dots; that each part of the film wasn’t rounded out into a more compelling or encompassing narrative. It frequently plays like a collection of good scenes. There are a lot of positives, especially for those interested in a portrayal of the illness. I would like to get one of the controversies out of the way. A number of people who suffer from anorexia nervosa have contested that the film is not a realistic account of the struggles/treatments/support. Writer and director Marti Noxon has countered back that it is an accurate representation of her own experiences and others that she consulted with. And that’s the point, just because a film doesn’t accurately reflect you or somebody else you know, doesn’t mean it’s not a realistic account for someone out there. No film is going to represent everyone. This one is just the story of Ellen (Lily Collins). You may or may not relate to her, but you would have to be cold-hearted not to feel empathy. At the beginning of the film, Ellen is in a group home, has a snarky reply to a fellow patient’s concern about death, and then she is shipped out of there, headed home. Ellen’s home life is best explained by a scene that occurs a little ways into the film. One last attempt (it’s characterized and feels that way because it’s either death or cured, and she has already tried everything else), Ellen is welcomed into an alternative group home. There’s only seven patients, a few nurses that mostly stay in the background, and a kind (but different) doctor (played by Keanu Reeves) who checks on them occasionally. Dr. Beckham tries to a family session with Ellen and invites her half-sister Kelly (Liana Liberato), her step-mother (Carrie Preston), her mother (Lili Taylor) and her mother’s new wife (Brooke Smith), and her father, who never shows up. Everyone is yelling and blaming each other while Ellen sits there unimpressed. Afterwards, Dr. Beckham correctly concludes that it was a disaster, as Kelly was the only one who wasn’t self-serving. At one point, Ellen describes her step-mother as a shark – she can’t stop talking or else she’ll die. Not surprisingly, her shrillness can test the audience’s patience. 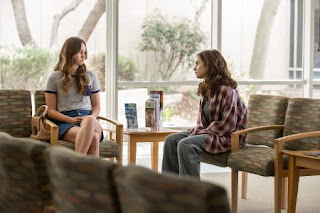 On the other hand, Liana Liberato’s Kelly was a welcome addition to the film. Not a large role, but she had a number of good responses and an excellent juggling of comedy and drama. The main group home scenes can slow down the film as we spend time observing Ellen’s interactions with the other patients, and their successes, but Ellen’s lack of success can be quite frustrating. She does have a love interest in the group home, played by Alex Sharp. He had a number of witty observations and is an interestingly crafted character. He’s a very accurate representation of a smart, young man, but one who is seldom seen on film. Unfortunately, he did lack chemistry with Ellen, but that could be on purpose. As we eventually get to the end, the film goes very alternative on the healing end, which can test viewer’s patience, but it also makes it more cinematic in its telling. Given the subject matter, To the Bone isn’t an easy watch, but it is at tines an interesting one. And perhaps the biggest compliment the film can receive, it provides sensibility and a deeper understanding for the struggles of an illness that is more prevalent in society than most movies have you believe.